The Orchard Garden was first established in 1948 by Arthur & Grace Mitchell to grow produce for the family and their pastry shop business. Today still in the family the garden is maintained by Jenni & Mervyn for food, beauty and a pleasant way of life. 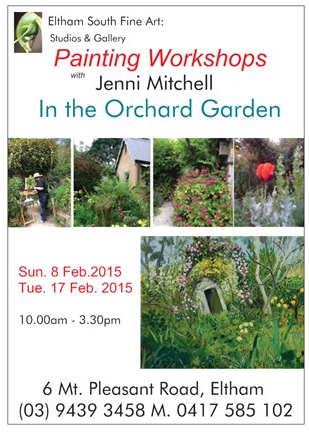 The workshop will commence with a demonstration by Jenni Mitchell followed by one to one tuition around the garden. The large garden has plenty of corners to set up an easel or drawing board in comfort. The focus is to capture on paper or canvas the essence of the garden quickly using your chosen materials. You will be shown how to view the subject using your Artists’ Eye. These workshops are suitable for all student levels including beginners & experienced artists who like to work with nature in a colourful garden setting. * Bring your favourite painting materials: oil, acrylic, gouache, watercolour, pencil or pastels. Lunch and refreshments provided. *basic art materials available for purchase at gallery. Cost $155.00 each or $285 for two workshops. includes home cooked lunch and refreshments. The Gallery will be closed 12 SEPTEMBER and reopen 10 OCTOBER. Jenni & Mervyn are heading off to Tibooburra to paint. We are saddened to acknowledge the passing of our gallery artist, friend and colleague PIERS BATEMEN. Piers has been in both Mervyn and my life forever. The Bateman family lived nearby when I was growing up in Eltham and came regularly to our Pastry shop. Piers was always the artist and when I began painting he made my first picture frames. He attended our local Eltham High School and contributed significantly to the artistic ethos of our community. Piers had the opportunity to work with and be mentored by some of our country’s greatest artists’ such as Arthur Boyd. We were excited for him when he had his first successful exhibitions and how proud he stood with those first achievements. He went on to have a highly successful career as an artist in Australia and overseas. He had a passion for the sea and travelling extensively making a home where ever he was and in particular Spain and more recently China. He began teaching painting as a Professor for the Shanghai Institute of Visual Art. Piers was an adventurer and great inspiration for just heading out there and doing it! We saw the Australian Desert through Piers’s paintings, our local Bush and later the works from China more recently. He made his mark as a strong and unique Australian Landscape artist and did not ever ‘sell out’ to the fashion of the day with his art. Piers has been showing at Eltham South Fine Art: Studios and Gallery since we commence and will be greatly missed for those regular chats and coffee around the table. Born in Perth Piers moved to Eltham with his family in 1957 where he spent his formative years and attended the local Eltham high school. In 1966 Piers travelled to London where he studied art with Arthur Boyd and shared studios with Canadian and English painters. He held his first exhibition in Melbourne at the Munster Arms Gallery in 1968 age 20. From thereon he has travelled and exhibited regularly in Australia and overseas as well as setting up a studio in Alicante Spain in 1985. He has work held in many Private and Public collections nationally and internationally including Shanghai; where he currently holds a position at the Shanghai Institute of Visual Arts. 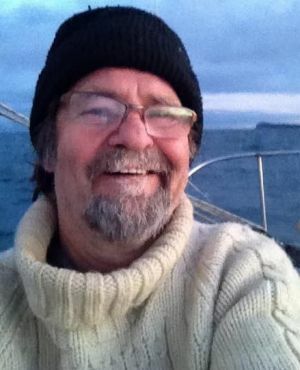 Former Liberal Andrew Peacock, has paid tribute to his “dear friend” landscape artist Piers Bateman, who died in a boating accident on Friday. Mr Bateman, 67, was accompanied by a friend from New South Wales, who also perished in the incident. In an email to Fairfax Media from his home in Texas, US, Mr Peacock said he was “very sad” to learn of the death. “Piers was a dear friend and I greatly admire his work,” he said. Mr Peacock said so much of the Melbourne artist’s work evoked a distinctive Australian spirit. “Piers was a fine artist and I will miss both him and his work,” he said. 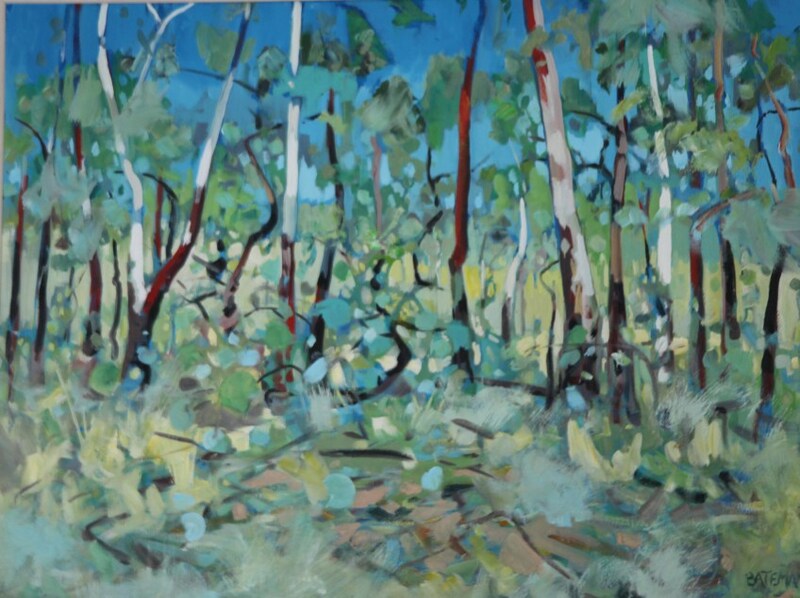 Mr Bateman’s work has been exhibited in art galleries in Australia and abroard, including the Red Hill Gallery in Brisbane, Eltham South Fine Art and the Shanghai Contemporary Art Fair. His art also hangs on the walls of the Reserve Bank of Australia, Melbourne University and the conference room in the Australian Embassy in Washington. The Etching Press will be available this Saturday Afternoon 21 February 2pm – 5pm for students and artists who attended the recent LinoPrint workshop. It will be available once a month for printing. Two upcoming events for Eltham South Fine Art include A LATE SUNDAY AFTERNOON LITERARY with SIGMUND JO RGENSEN. Sunday 15 February 3.00 – 5.00. For further details and bookings click here… Late Sunday Afternoon with Sigmund Jorgensen. The Eltham South Fine Art: Gallery & Studios will officially re-open for 2015 Thursday 29th January. (The gallery will be open on other days before the 29th if we are working in the studios.) The gallery will be open regularly Thursday, Friday, Saturday. Sundays – please check first. Eltham South Fine Art is an artist-run-space and to enable us to pursue our own artistic life will not be opening every Sunday in 2015. Eltham South Fine Art is a working studio, gallery and the family home of artists Jenni Mitchell and Mervyn Hannan. The gallery space permanently exhibits the family works of painting, print, sculpture, textile, jewellery and books by the Mitchell, Hannan and Skipper family; Jenni Mitchell, Grace Mitchell, Mervyn Hannan, Joe Hannan, Sonia Skipper. and Sigmund Jorgensen. The gallery also exhibits our contemporaries and has work from the early Eltham artists for a sense of Eltham history; Alan Martin, Leslie Sinclair, Peter Glass, George Chalmers, Piers Bateman and more. As well as the studio and gallery visitors are welcome to wander through the orchard garden which was originally established by Arthur and Grace Mitchell in 1948. Textile and jewellery from Afghanistan, Mongolia, Nepal, Timor and Turkey. We also offer custom Picture Framing and have been framing as Studio Framing since 1988. Painting classes are held with Jenni Mitchell and Mervyn Hannan and will be commencing for 2015 from Thursday 29th January. 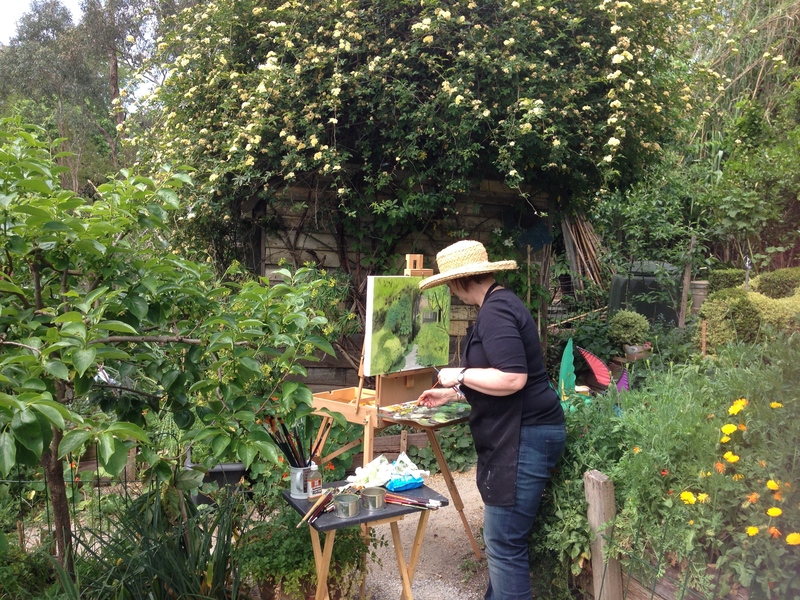 Painting and Drawing Workshops are organised throughout the year and held at the Studio, The Orchard Garden, The Yarra River and other Landscape locations. These will be posted at they are organised. There are currently places available in the Orchard Garden Workshops for February. The Lino Print workshop for January is full at this time. A series of four new workshops have been planned to work with Jenni Mitchell and Mervyn Hannan both in the Artists Orchard Garden at the gallery and in both Wingrove Park Eltham and along the Yarra River in Warrandyte. Jenni Mitchell’s Painting Students Exhibition. The first exhibition by 27 of Jenni Mitchell’s Eltham Studios painting students will open Sunday 28 September at Eltham South Fine Art: Gallery & Studios. This is the first student show at the gallery since moving the teaching studio from Montsalvat to the studio and home of the late pastry cook and sculptor GRACE MITCELL. The last exhibition of Jenni’s students was held in the Long Gallery at Montsalvat several years ago. I am excited at the breadth of the work in this show. Most of the students are from the Eltham and Nillumbik area and range in ages from 11 – 76. Some of my students have been working in my studios for eight years and others just a few months. The diversity of the work also ranges in styles and materials from works on canvas, paper, oil paint, pastel, pencil and water based paints. The Exhibition subjects include simple black and white studio studies to complex and intricate still life paintings, the orchard garden at the studio and paintings from recent plein air workshops in Wingrove Park and the Yarra River. The quality of the work in show is excellent due partly to the disciplined basis of the tonal painting technique encouraged in the studio. My philosophy is to encourage them to spend the time in developing good painting skills through a formal understanding of tone using first black and white to understanding how to ‘see’ the subject objectively. By using these classical early techniques the artist students are able to develop their own methods in which they may ‘express themselves’ through any medium and will have knowledge of how make their art with conviction rather than by using the hit and miss approach. Many students will be hanging their work in a gallery for the first time while others have been exhibiting regularly. The idea of the show came from the students who wanted to experience the complete process learning and making art through to the exhibition. Also on exhibition are works by Mervyn Hannan’s pastel students. Mervyn has been taking classes also this year. Students are able to take classes with both Jenni and Mervyn. This is an opportunity to show support for the thriving artistic community in our area as well an opportunity to make a purchase from new and emerging artists who may become our Finest Artists of the Future. Some works are for sale and are reasonably priced. The Exhibition will be opened by Councillor Helen Coleman 2.oopm Sunday 28 September and run until 12 October – Wednesday’s to Sunday 10.00am – 5.30pm. Eltham South Fine Art: Studios & Gallery grew out of the Mitchell family property in Mt. Pleasant Road. My parents, Grace and Arthur Mitchell purchased the property in 1948 – an old rambling weatherboard cottage stood at the top of the block. When my father became ill Grace built a small tearoom and pastry shop, as a way of earning an income to support Arthur and her young child (Jenni) then. Together they built the large orchard garden that survives today. (Mervyn and I maintain the garden as well as run the gallery and teaching studio to help preserve this little piece of Eltham history). After Grace retired from the shop, age 67 she got a driving license and completed a fine art degree at RMIT. The ‘tearooms’ then became her home and sculpture studios. The old cottage is now a mudbrick house and Jenni’s painting studio. When Grace passed in 2011 at nearly 95yrs Mervyn and I decided to turn her home and studio into what is now ELTHAM SOUTH FINE ART: Gallery & Studios. Prior to this I rented the Studio at Montsalvat by the pool as my teaching studio. Seemed wasteful to continue to pay rent to Montsalvat when I was also paying rates for Grace’s house; and we didn’t want to sell to a developer; which was suggested. Grace would be delighted to see her home being used as a gallery and studio today. She loved to teach too and used to teach pottery and bee keeping at the Eltham Living and Learning Centre. 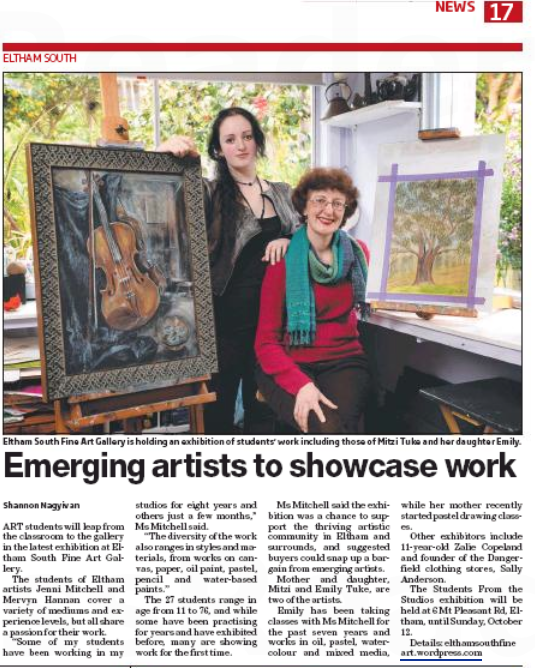 We have had several shows at the gallery in the last couple of years including an important RETRO ELTHAM SHOW in which we exhibition 61 artists who were working in the Shire during our youth (1960s – 1980s). Mervyn and I both want to continue to show the art and history of local region. Both Eltham born and with strong ties to Montsalvat from an early age we have a sound knowledge of the arts history in region, and how quickly it can disappear.